Members of the Mid-South Raptor Center recently went to the small west Tennessee town of Williston to check out a nest of Barn Owls that had taken up residence in an 1845-era house that was undergoing renovation. The owls had nested in the attic of the home for many years and the owners were willing to let this last clutch remain until they fledged, but it would then be necessary to repair the roof, making it impossible for the birds to return to nest there next year. 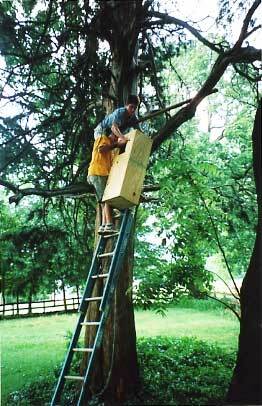 The owners were happy to let us mount a nesting box in a nearby cedar tree so the birds would have a nest when they returned next year. 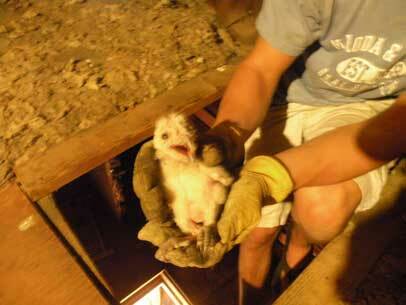 Once we had secured the box, we moved into the attic to band the five baby owls. Once banded all were returned to their nesting area to be reunited with their parents. Raptor Center volunteer and US Fish & Wildlife Service bird bander Martha Waldron was assisted by Johnny May in banding of the babies. 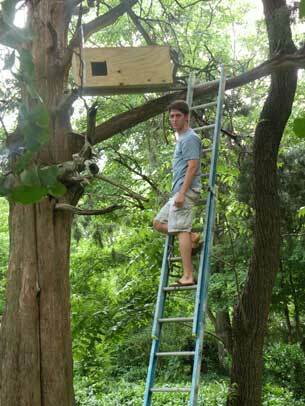 Her husband, Jim, was also aided by Johnny in placing the nest box in the cedar tree nearby. Johnny, a pre-vet student at Mississippi State University in Starkville, has been a volunteer at the center for several years. 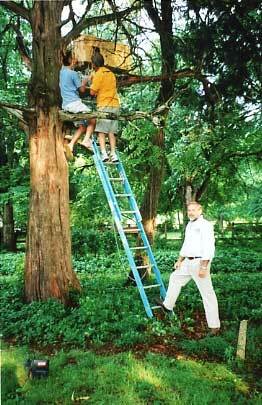 Jim and Martha have over 50 years of experience between them in raptor rehab. ©2008 Mid-South Raptor Center. All rights reserved.